Property 8: Walk a Block to Uptown (Our Downtown) to the main shops, tours, restaurants. Property 9: Executive 1 bedroom Loft in the heart of Sedona - super location, nice views! Property 11: 2-Acre Sedona Casita w/ Deck & Red Rock Views! Sedona Summit Resort- Red Rock Views! Best Rates in Sedona! Property 22: Sedona Summit Resort- Red Rock Views! Best Rates in Sedona! Property 23: Executive 1 bedroom Loft in the heart of Sedona - super location, nice views! Property 33: NEW! SERENE 2 BEDROOM APT. SURROUNDED BY FOREST, GOLF COURSE & RED ROCK VIEWS! Sedona guest room, private entrance, great location! Property 35: Sedona guest room, private entrance, great location! VIEW WITH A SUITE; Enjoy these ACTUAL VIEWS! Great location! Property 38: VIEW WITH A SUITE; Enjoy these ACTUAL VIEWS! Great location! Studio Unit With King Size Bed! Property 40: Studio Unit With King Size Bed! The Historic Clarkdale Lodge is your adventure headquarters! Property 45: The Historic Clarkdale Lodge is your adventure headquarters! Property 47: Dragonfly Spectacular Views Bike Trails & Hiking! Property 48: NEW! Lovely Sedona Guest Suite in Center of Town! My wife and I recently celebrated our 10 year wedding anniversary in Sedona, and chose Linden's place as our 'home base' to explore this truly magical place. That said, here was our takeaway: HOST: Linden is amazing, and truly a superhost in every sense of the word. From the moment we arrived, she was warm, friendly and very helpful. Five stars here! 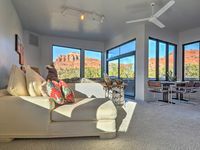 LOCATION: Linden's place is set in a beautiful location on a quiet street amidst a red rock landscape, literally less than a 10 minute walk from the main strip in Sedona. The location is ideal in every single way. At night, you will be able to see an endless sea of stars right from your front porch, tucked far enough away from the hustle and bustle in addition to Sedona being a Dark Sky Community. Side note: If venturing out at night for a stroll, take flashlights, Sedona gets THAT dark. ACCOMODATIONS: Truer words were never spoken, this IS a VIEW WITH A SUITE. With floor to ceiling windows at the front of the unit, you literally have a virtual panoramic view right from your kitchen table and bed! The photos do not lie, they are SPOT ON. The unit is perfect, with Linden providing for every need. Like a previous visitor, we also found ourselves calling this place 'home' for the full week we were there. From the fully equipped kitchenette, huge large screen TV, super comfy bed and sofa and other amenites, we found ourselves wanting for nothing. Truth be told, it was very hard leaving when our last day arrived. GROUNDS: Aside from the convenience of being able to park right in front of our unit, you also have your own private balcony, which is amazing for stargazing or watching the sunset reflecting off the red rocks. In addition, there is also a shared porch on the other side of the house that is equally as serene. Linden maintains this property incredibly well, and gave me the opportunity of seeing a hummingbird for the first time in my life on our first day there. So many incredible experiences here. THE BOTTOM LINE: If you are seeking a place to truly escape and enter a surreal landscape, Linden's place will not disappoint. From the incredible setting, fantastic unit, and amazing host, my wife and I would return here in a heartbeat (and we will). Get out to Sedona, embrace all it has to offer, escape to serenity, find your inner peace, explore its magical surroundings and above all else, stay HERE to do it all. As good as represented in previous reviews. Highly enjoyable stay. Convenient location yet very private feeling. Property was clean and well maintained. Owner is a good hostess. Highly recommended. We enjoyed hiking trails nearby and ate at Red Rock Caf&eacute; several times. For more upscale evening meal, try Cusina Rustica.